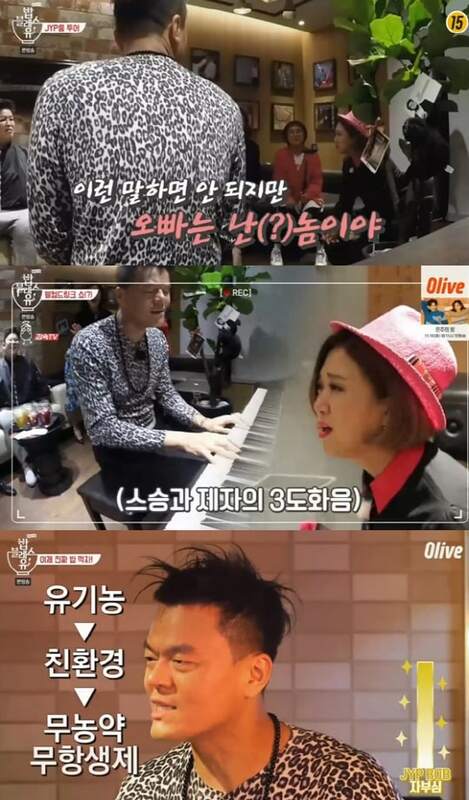 Park Jin Young appeared on Olive TV’s “Food Bless You” and welcomed the cast to his agency’s headquarters. On October 25, Kim Sook, Lee Young Ja, Choi Hwa Jung, Song Eun Yi, and Jang Do Yeon visited the new JYP building and its cafeteria. Before eating, the cast got a tour of the JYP Entertainment headquarters from a practice room to the CEO’s office. Park Jin Young revealed, “The entire building is made of non-toxic eco-friendly material. The building was designed for new employees. It’s possible to dine by yourself and the rooftop is breathable.” When he added, “We control the temperature and humidity down to the decimal point,” Kim Sook expressed how impressed she was by him. Lee Young Ja and Choi Hwa Jung gave him advice by reminiscing about their own memories with their dads. Jang Do Yeon became emotional and cried during the conversation. “Food Bless You” airs on Thursdays at 9 p.m. KST.